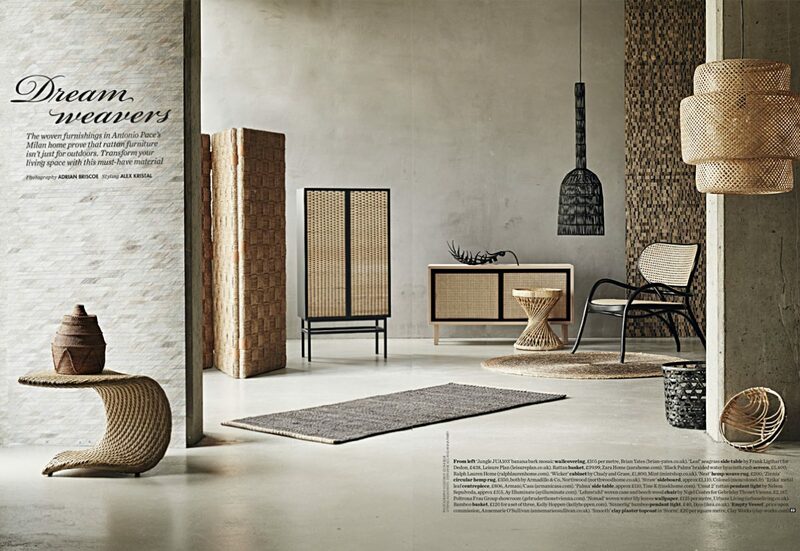 Rattan is featured in the June 2016 issue of Elle Decoration as a ‘must-have material’ for interior decoration and is styled here by Stephanie Iles and Anna Parry against the back wall of Clayworks Top Coat in colour Storm. Rattan, like clay plaster, is a natural material with environmental benefits when harvested sustainably, as explained by the WWF. In a separate article in the same issue, architectural historian Clare Sherriff paints a frightening picture of the mass of toxins swarming modern homes; formaldehyde, lead, chemicals, preservatives, dusts, synthetics and pesticides to name but a few. Sherriff refers to these as ‘new developments on the horizon’, whereas we believe strongly that these are the ancient methods and that the ancient building materials and methods are the future ones. The use of soil is the key to the future of architecture. Sherriff talks also about Japanese architect Yasuhiro Yamashita of Atelia Tekuto who, like us, has applied modern scientific knowledge and innovation to ancient building methods to create very high performing building materials. In his case, particularly strong ‘earth bricks’. In fact, says Sherriff, Yamashita believes the use of soil is key to the future of architecture. ‘It offers excellent heath and sound insulation, humidity-control properties and most importantly, it is available at reasonable cost everywhere. It is also harmless to the environment’.